Psoriasis is a non-contagious inflammatory disease. The main symptoms are reddish, scaly patches of skin that may itch. It is a chronic condition that is typically associated with periods of more severe skin problems (flare-ups) followed by periods of milder skin problems or none at all. Various treatments can relieve the symptoms, but there is no cure for psoriasis. Its severity can vary quite a lot. In some people it is bothersome more than anything else, and they can cope with it quite well. Others feel that it has a major effect on their quality of life, since the treatment and skin care can take a long time. Many people are also unhappy about having visible reddened and scaly skin patches – especially if they are on exposed areas of their body. Sometimes the inflammation that is causing the psoriasis affects other parts of the body too, such as the joints or nails. There are different kinds of psoriasis. The most common is plaque psoriasis. This condition is associated with clearly defined areas of slightly raised red patches with silvery, flaky skin. The patches of skin are referred to as "plaques," which is why it is called "plaque psoriasis." The plaques often develop symmetrically on both sides of the body, for example on both the left and right knee. They usually itch as well. The skin is often irritated from scratching, and it may be damaged. The size of the plaques varies greatly, ranging from anywhere between one and more than ten centimeters in diameter. Some people have only a few plaques on certain parts of their body, for example only on their scalp. Others may have more, either on one part of their body or in several places. The skin on the hands and feet can become very dry and crack. This can be very painful – especially if the cracked skin stretches when you move, comes into contact with irritants like citric acid, or bumps into something. Plaque psoriasis can basically develop anywhere on the body. The head, elbows, knees and back are commonly affected. Plaques also often occur behind the ears and on the hands, feet and belly button. Less commonly, they can also occur in skin folds such as the creases of skin in the groin or between the buttocks, under the armpits, in the genital area or under and between the breasts in women. That kind of psoriasis is called inverse (flexural) psoriasis. It is often less scaly because the skin in these areas generally isn't as dry and there is constant friction so not many plaques develop. Sometimes the nails of people with plaque psoriasis are also affected. In nail psoriasis small holes develop in the nails (pitted nails), the nails grow thicker, or they turn yellowish-brown ("oil drop" discoloration). The nails might also become loose. Another type of psoriasis is known as pustular psoriasis. Here the symptoms also include pus-filled blisters (pustules). These pustules aren't contagious, though. Pustular psoriasis can occur on its own or together with plaque psoriasis. One quite rare form of psoriasis is guttate psoriasis, which is characterized by a large-scale acute rash with small, drop-like bumps. It is most common in children and teenagers, and usually occurs one to two weeks after a certain type of bacterial infection (Streptococcal infection). Guttate psoriasis may heal completely within a few weeks or months, but it can also come back or turn into plaque psoriasis. 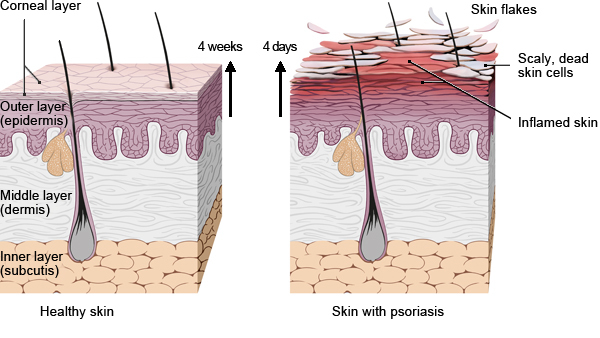 In plaque psoriasis, the skin becomes scaly because the skin cells that harden the skin (keratinocytes) multiply too fast. These cells are found in the outermost layer of the skin and form the protective epidermis. In healthy skin they multiply, pass through several phases of development, and are then usually shed within four weeks as dead skin cells. In psoriasis, the keratinocytes go through this cycle much more quickly, sometimes in as little as four days. This results in dead skin cells not being shed quickly enough to keep up with the new skin cells being produced. The skin then becomes thicker and flakes off much more on the affected areas. The rapid growth of skin cells in people with psoriasis is caused by an autoimmune response. Various inflammatory processes play a key role here. The skin is often red due to inflammation and increased blood flow. A whole series of genes have now been linked to psoriasis, but the causes of this condition are not yet absolutely clear. Psoriasis is mostly caused by genetic factors. Having a family history of the disease is the greatest risk factor. The probability that a child will develop psoriasis is about 15% if one parent has the condition, and about 40% if both parents have it. But there is no reliable test for predicting whether someone will get psoriasis. And there is currently no known way to prevent psoriasis either. Psoriasis is a relatively widespread disease. It is estimated that about 2% of the population is affected – that would be over 1.5 million people in a country the size of Germany. About 80% of people with psoriasis have plaque psoriasis. Men and women are equally likely to get it. Psoriasis often first arises in the first 40 years of life, and especially commonly in teenagers or young adults. But it can start in earlier childhood as well. If it develops later in life, it usually starts between the ages of 50 and 70. Psoriasis is sometimes categorized according to when it started: Type 1 psoriasis starts before the age of 40. Type 2 psoriasis starts later on – between the ages of 50 and 70. It is impossible to predict how someone’s psoriasis will develop over time. The condition often comes and goes in episodes: Periods of more severe symptoms alternate with periods in which it hardly causes any trouble. Most people with psoriasis will at one point experience symptoms that are especially severe and distressing. But there are usually also phases without skin problems, or hardly any at all. Some people constantly have severe psoriasis, though. Psoriasis flare-ups may be caused by things like a sunburn, a very hot shower, particular chemicals or minor skin injuries, scratching, tattoos or piercings. Other triggers include emotional stress, infections and nicotine or too much alcohol. It is also thought that some medicines might act as triggers, including some malaria drugs. Psoriasis is an inflammatory autoimmune disease that can affect the skin and other parts of the body too. It is estimated that about 20% of people with psoriasis also have inflamed joints. This is called psoriatic arthritis. It is a good idea to seek medical advice if you think you have psoriatic arthritis. The sooner joint inflammation is discovered, the better it can be treated and the easier it is to avoid joint damage. In rare cases, psoriasis can result in chronic inflammatory bowel disease. Many people who have psoriasis also have depression because the condition can be very emotionally trying and make you feel alone. Studies have shown that people with psoriasis are also more likely to have high blood pressure, diabetes, and cardiovascular disease. There are various possible explanations for this. For example, many people with psoriasis are overweight and have a body mass index (BMI) of over 30. The inflammatory processes in the body can also contribute to the development of metabolic and vascular disease. Psoriasis is usually not dangerous. Very rarely, though, it can cause life-threatening complications that require hospital treatment. For instance, psoriasis can spread over the entire body and then cause blood poisoning and heart problems. This is called erythrodermic psoriasis ("erythroderm" comes from the Greek for "red skin"). The signs of this complication include fever, exhaustion, chills and swollen lymph nodes. Dermatologists (skin doctors) usually diagnose psoriasis on the basis of typical changes in the skin. They may take a small skin sample and examine it if they aren't sure. This can be a good idea when it comes to inverse psoriasis, for example: It only occurs in folds of skin and usually isn't scaly, so it is sometimes mistaken for a fungal infection. Skin samples can help to rule out fungal infections. Nail psoriasis is sometimes confused with a fungal nail infection. But sometimes both conditions occur at the same time. A nail sample can be tested to determine whether the symptoms are being caused by a fungal infection. it has a major impact on the person's quality of life. These are used to calculate a number representing the severity of the psoriasis. A PASI of 0 means no psoriasis, and a PASI of 10 or more means moderate to severe psoriasis. This index is mostly used in scientific studies to determine whether a treatment is effective. Basic therapy (skin care): Care of the affected areas of skin using lipid-replenishing ointments, creams or lotions. This is done to keep the skin supple, protect it from injury and relieve itching. Some products also contain medications that are supposed to reduce shedding, such as urea or salicylic acid. Topical treatment: Products containing corticosteroids or vitamin D analogues are typically used in topical treatment (treatment applied to the skin from the outside). These are available in the form of creams, ointments lotions or foams. Light therapy: Light therapy, also known as phototherapy, involves exposing the plaques to ultraviolet light (UV light). The UV light reduces inflammation in the skin, and also slows the production of cells. Sometimes medications called psoralens are used in combination with light therapy. Psoralens make the skin more sensitive to light. Light therapy is best suited for people who have moderate or severe psoriasis and in whom topical treatment alone wasn't effective enough. Medications that are taken orally or injected: These medicines are a treatment option for moderate or severe psoriasis. They inhibit the body's immune response. Methotrexate (MTX), fumaric acid esters, apremilast and biological drugs (biologics) are commonly used for this purpose. Basic moisturizing skin care is always recommended for psoriasis – during periods without any skin problems, too. There are also many herbal medicines for the treatment of psoriasis, including extracts of barberry (Mahonia aquifolium), birch bark or aloe vera. The effectiveness of these herbal medicines hasn't been tested in any good-quality studies, though. So it isn't known whether they can help. Some studies suggest that people with psoriasis who are overweight can improve the condition of their skin by losing a few pounds. It is sometimes claimed that a tonsillectomy (removal of the tonsils) can relieve psoriasis symptoms, but there hasn't been much research in this area. Tonsillectomy usually isn't recommended because the operation may cause complications such as infections, bleeding and changes to the person's voice. There are also no studies showing that having your tonsils out can cure or prevent psoriasis. Does light therapy (phototherapy) help reduce psoriasis symptoms? Psoriasis is a very distressing condition to have. It can be a major challenge to combine the extensive skin care and various treatments with everyday commitments, work, family and social activities. At night the itching is often so bad that it can be difficult to sleep, leaving you tired and exhausted the next day. Although the condition is so common, people with psoriasis often feel like others avoid them – perhaps because they mistakenly assume that it is contagious. Everyday activities such as going to the hairdresser can become very stressful. Fear of how others will react can affect quality of life and cause some people to become withdrawn. Many people with psoriasis find it helpful to talk with others who have the disease. In self-help groups, for example, you can share your feelings and experiences and discuss practical problems that people who don't have psoriasis often have difficulty understanding. There are many sources of support for people with psoriasis, including self-help groups and information centers. But many of these facilities are organized quite differently. Our list can help you find and make use of local services in Germany. Boehncke WH, Schön MP. Psoriasis. Lancet 2015; 386(9997): 983-994. Farahnik B, Sharma D, Alban J, Sivamani RK. Topical Botanical Agents for the Treatment of Psoriasis: A Systematic Review. Am J Clin Dermatol 2017; March 13, 2017. Farahnik B, Sharma D, Alban J, Sivamani R. Oral (Systemic) Botanical Agents for the Treatment of Psoriasis: A Review. J Altern Complement Med 2017; February 03, 2017. Griffiths CE, Barker JN. 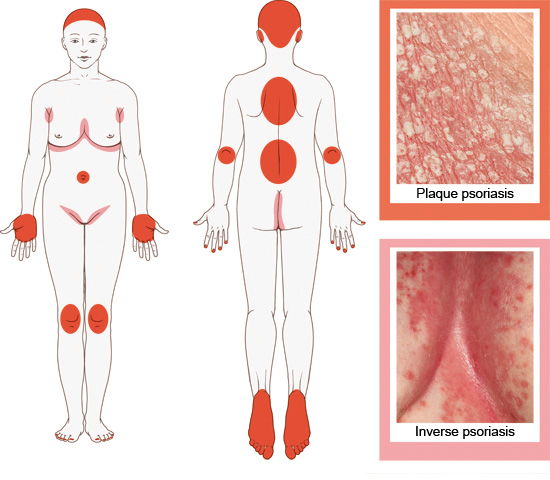 Pathogenesis and clinical features of psoriasis. Lancet 2007; 370(9583): 263-271. Lebwohl M. Psoriasis. Lancet 2003; 361(9364): 1197-1204. Reich K, Krüger K, Mössner R, Augustin M. Epidemiology and clinical pattern of psoriatic arthritis in Germany: a prospective interdisciplinary epidemiological study of 1511 patients with plaque-type psoriasis. Br J Dermatol 2009; 160(5): 1040-1047. Upala S, Sanguankeo A. Effect of lifestyle weight loss intervention on disease severity in patients with psoriasis: a systematic review and meta-analysis. Int J Obes 2015; 39(8): 1197-1202. Weigle N, McBane S. Psoriasis. Am Fam Physician 2013; 87(9): 626-633. World Health Organization (WHO). Global report on psoriasis. Genf: WHO; 2016.